The third Intro project. This project focused on the relations between colors, as well as the usage of symmetry. The project assigned for us to learn about color was to create a mandala, a figure which drawn digitally in Illustrator, printed out, and painted by hand. 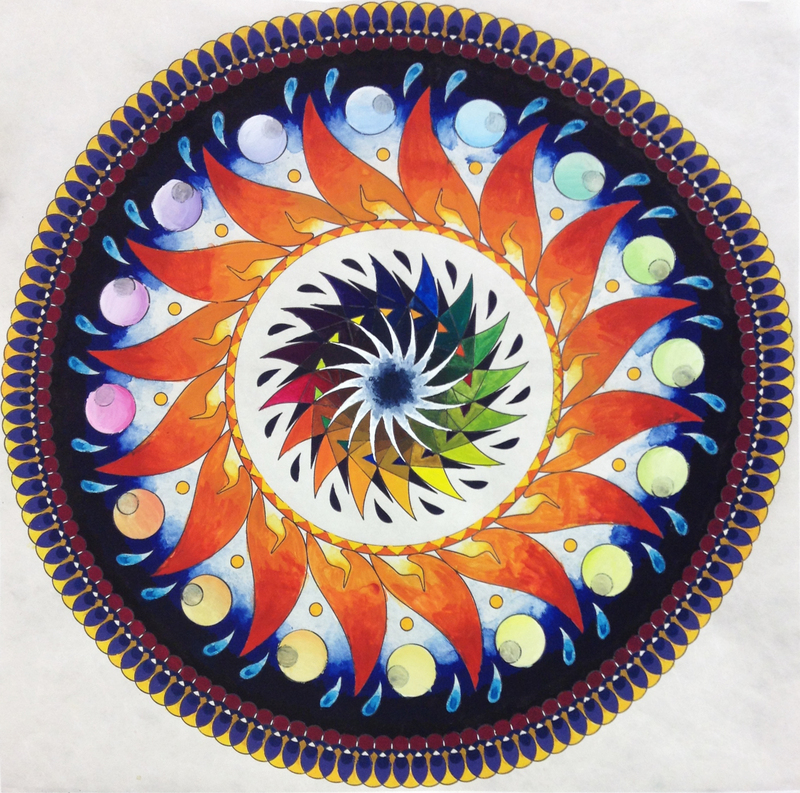 My own mandala features a sun-and-moon motif, with a color wheel core. When designing the mandala, I tried to come up with a design that would allow incorporation of both warm and cool colors. The hot fire of the sun and cool colors of the night sky would not only create the perfect excuse to use both temperatures of color, but also would be easily recognizable. The different hues were easily incorporated by using the center as a color wheel. The color wheel itself was also an easy way to throw in the intensity change- after all, it provided a lot of different samples to change the saturation of, and would clearly display the change in every hue. The complimentary colors, too, were achieved here, as the complimentary for each color appears inside its section of the wheel. A value scale was also not hard to incorporate- the tried-and-true changing from the daytime sky into the nighttime sky provided a fitting scale. And as for the mixing colors, nearly all of the colors on the painting were mixed; however, the flames on the sun change directly from orange to red. The symmetry I chose was all rotational symmetry, as I’m not particularly fond of using vertical or horizontal symmetry in a round figure. It fit very well, however, with the sun’s shape as well as the border and raindrops. The color wheels lead the eye around in a circle, and therefore around the piece. This entry was posted in Non Time-Based and tagged Digital Art, Guoache, Intro to Visual Communication, Mandala. Bookmark the permalink.